Americans have uniformly negative views of North Korea and its nuclear ambitions – a subject likely to be high on the agenda when President Donald Trump meets in Florida this week with Chinese President Xi Jinping. 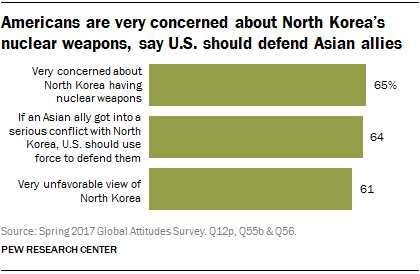 Roughly two-thirds of Americans (65%) are very concerned about North Korea having nuclear weapons. And 64% say that in the event of a serious conflict, the United States should use military force to defend its Asian allies, such as Japan, South Korea or the Philippines, against the Pyongyang regime, according to a new Pew Research Center survey. A further 61% think sanctions, rather than attempts at closer ties, are the best way to deal with the nuclear threat posed by the Democratic People’s Republic of Korea. Overall, 78% of Americans have an unfavorable view of the communist nation ruled by Kim Jong Un, with 61% holding a very unfavorable opinion. Negative attitudes toward North Korea are shared across demographic groups, though more college-educated Americans hold negative views (91%) than do Americans with a high school education or less (69%). Unlike public opinion on other aspects of U.S. foreign policy, there are no significant partisan divides on attitudes toward North Korea. However, when it comes to concerns about North Korea’s nuclear arsenal, there is a slight partisan difference. Roughly three-quarters of Republicans (74%) are very concerned about the weapons program, compared with 66% of Democrats. There is a larger division by age on concern about the North’s nukes. 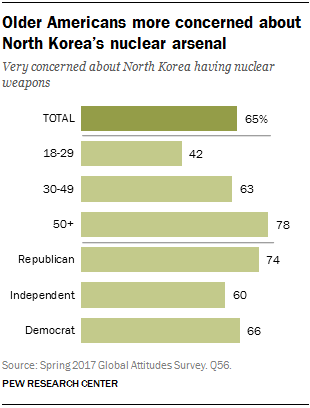 Nearly eight-in-ten Americans ages 50 and older (78%) say they are very concerned about North Korea having nuclear weapons, compared with only 42% of 18- to 29-year-olds. On the question of defending U.S. allies in Asia in the event of an attack by North Korea, 64% of Americans say the U.S. should use force to defend its allies, while only three-in-ten say the U.S. should not. Republicans are more likely than Democrats (70% vs. 61%) to favor using force if there were an attack, which is required by treaties signed with Japan, South Korea and the Philippines. Men (73%) are also more likely than women (56%) to say the U.S. should defend Asian allies in this hypothetical situation, and college-educated Americans are more willing to use force (74%) than are those with a high school education or less (59%). When given an option between increasing economic sanctions against Kim Jong Un’s authoritarian regime to deal with its nuclear program or deepening ties with North Korea, 61% of Americans prefer increasing the already-severe sanctions that are in place. Only 28% say they want to deal with the nuclear issue by engaging more and deepening ties with the country. Republicans (70%) are keener on sanctions than Democrats (61%), as are older Americans (69%) compared with young people (49%).